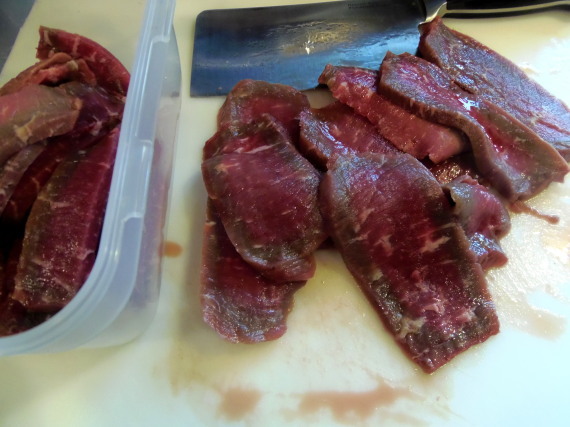 -Slice the meat across the grain into very thin slices, approximately 1/4″ thick (to make this easier, place the meat in the freezer for 20 minutes prior to slicing). -Pat the meat dry with paper towels. 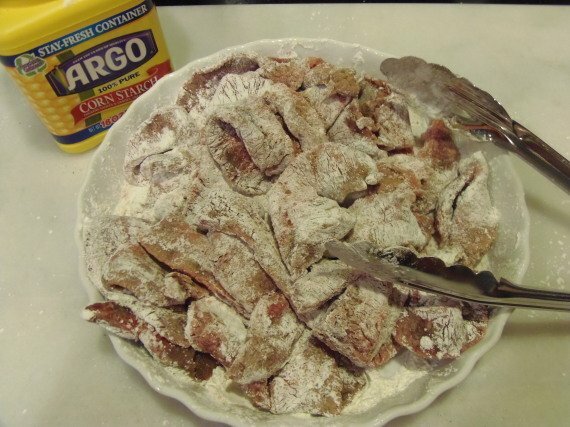 -Place the sliced meat in a shallow dish and toss with the cornstarch to coat all the pieces. -Place the meat aside while you prep the veggies and prepare the sauce. -In a small saucepan over medium heat, add the next 8 ingredients and simmer until the sauce is thickened and reduced. 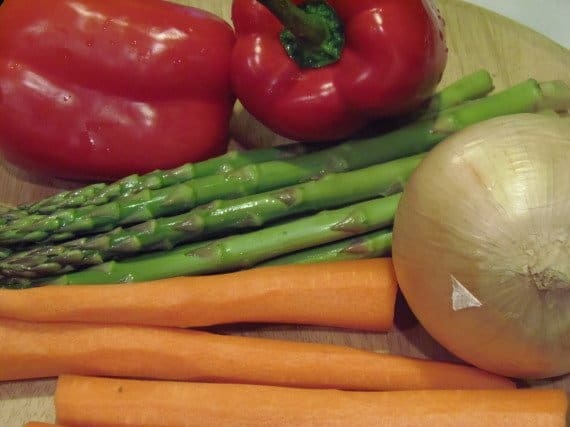 -In a wok, or large saute pan over medium high heat, add 1 tablespoon of the canola oil and the prepared carrots, bell peppers, onion and asparagus to the pan. 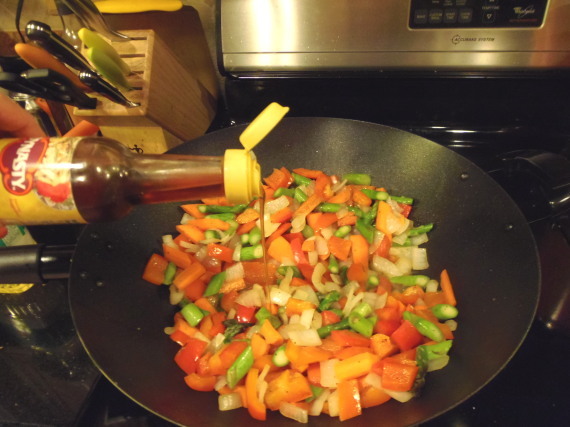 -Season with half the salt and pepper and drizzle with 1 teaspoon of the sesame oil. -Add the sesame seeds (saving some for garnish). 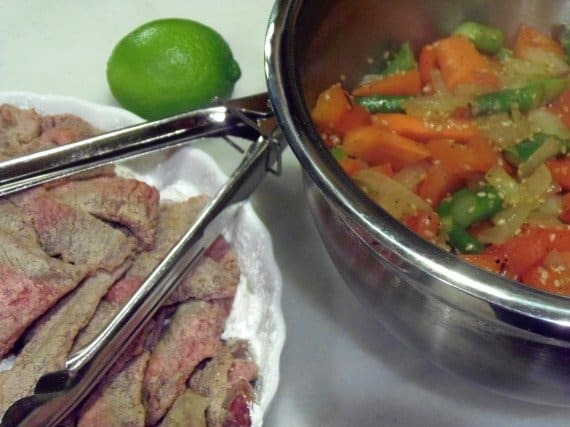 -Stir and cook the veggies until they’re slightly tender but not wilted. 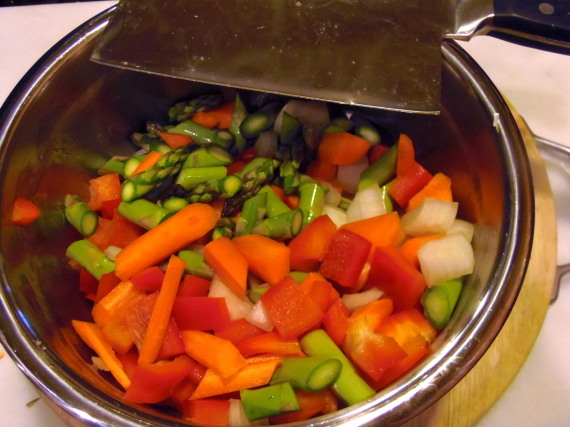 -Remove the veggies to a bowl and set aside. 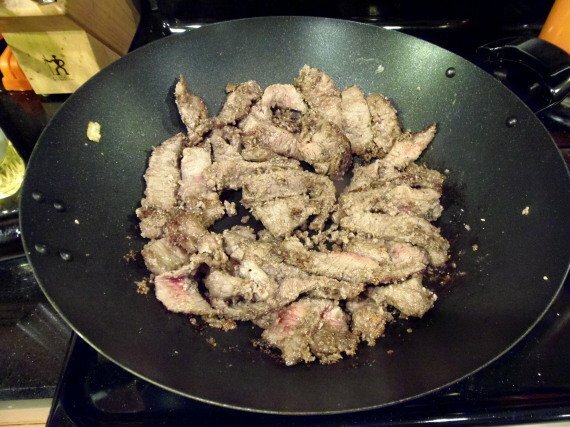 -Add 1 tablespoon of canola oil into the pan and add the meat. -Cook over medium high heat until the meat is just browned and still pink in the middle (this will only take about 5 minutes because the meat is cut so thin). -Season with the remaining salt and pepper. -Add the veggies back into the pan with the meat and stir to combine. 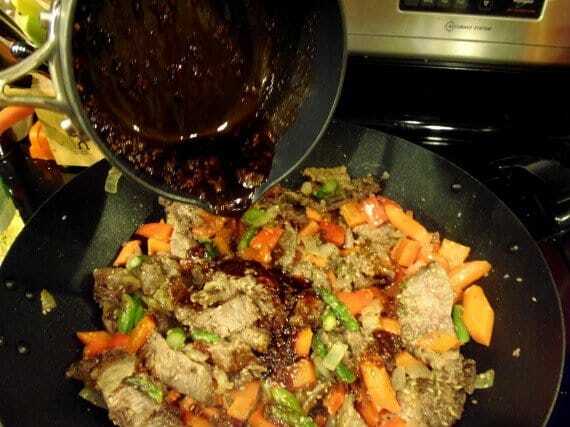 -Add the thickened sauce to the meat and veggies and stir well to coat and just to warm through. 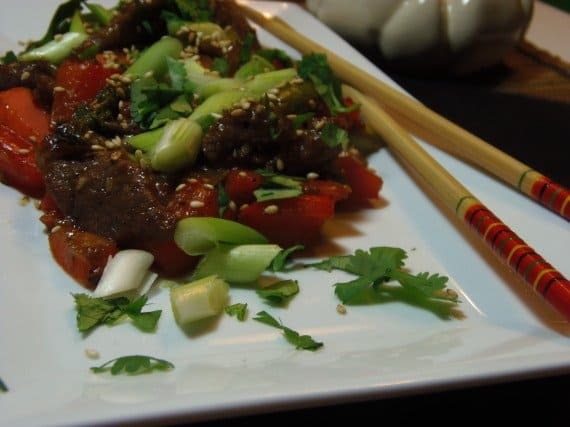 -Plate the Mongolian Beef and garnish with the scallions, chopped cilantro and additional sesame seeds. 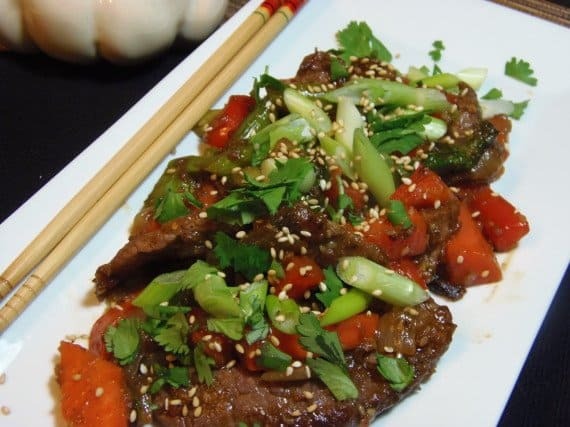 You may wish to serve your Mongolian Beef over a bed of rice or maybe some Asian noodles. Because we’re watching our carb intake, we (and when I say we, I actually mean me) opted to serve this just as is along with an additional side salad. Good and good for you!!! Until we eat again, thanks for visiting me in my Kudos Kitchen. I hope you’ve enjoyed this recipe!!! Oh My! I'm wishing I didn't give my wok away. I guess I could fry this up in a good skillet though and still have the same great taste. Looks scrumptious Renee. this one must be delicious. Looks so yummy! 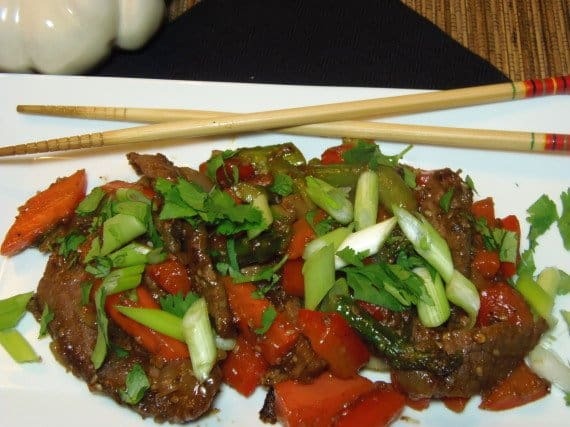 I love dish with Mongolian beef in it..I like it a lot, you're very talented ! Thanks for sharing!I had featured u in the post of Top 7 Soup Recipes for Mothers on AllFreshRecipes, expecting ur refreshing eats!